JAC are a global medicines management company providing bespoke solutions for hospitals and care providers, increasing patient safety and aiding patient care.With a disparate approach to discussing each of their products, there was a commercial need to create a single tone of voice and concept around what they provide, with the opportunity to then discuss the nuances of each product in its own right.We were selected to update their brand and create a cohesive digital presence to better showcase their unique and life saving products. The branding process, including a number of team workshops allowed us to clearly define a personality and positioning for the brand that centred around its scientific nature and focus on precision. JAC define themselves by offering the most advanced solutions within their marketplace furthering patient care. We wanted to visually communicate the idea of ‘advancing’, motion and progression within the industry. This resulted in a moving line within digital and broken line to suggest movement within print. 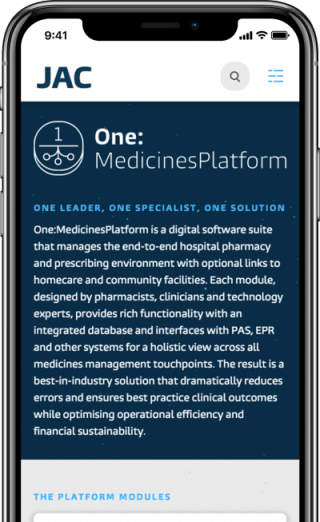 Correctly positioned as leaders within their field, this new approach elevates the insightful work and services that they provide, underlined by the mantra of Advancing medicines management. To represent different aspects of their core offering we created two different icon sets to suit both a product suite and other key aspects of interest such as interoperability. These icons are designed to feel owned by the brand and allow JAC to better communicate their offer. We were inspired by the curvature and personality of the Burlingame typeface, harnessing the curves of the letters to create our icons for the products. The typeface also has a human feel to it, perfect to balance what would otherwise be a clinical site. Take note of how the icons are not perfect circles (just like the font). To maintain consistency across all platforms we helped direct the brand implementation, setting the tone and best practice for how the visual style and system works. This included documenting the stylistic details, such as corner radius on brand elements, type sizing, line weight and other do’s and don’ts. We selected two photographic directions that could feel owned by the JAC brand. Inspirational star images that include a sense of motion alongside location, or real world scientific photography. These both reflect the personality and the ultimate aim of patient care at the heart of the JAC brand. The inclusion of photography equipped JAC with the brand elements to effectively communicate across all platforms and mediums; physical and digital. The design carefully took into consideration mobile usage ensuring great UX whatever the device. Our work with JAC has resulted in a newly positioned digital presence with the opportunity of consolidating how they present their product range. 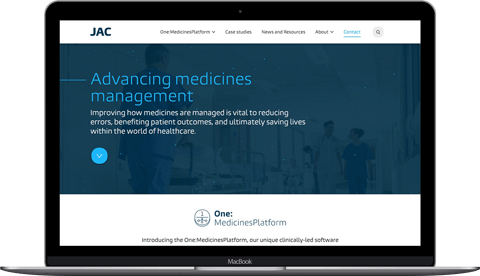 By uniting the products under the One:MedicinesPlatform we have established a narrative that can be more easily communicated to customers. The digital design approach has elevated JAC’s site to become a useful tool with clear structure and a strong sense of visual style focused around user experience.